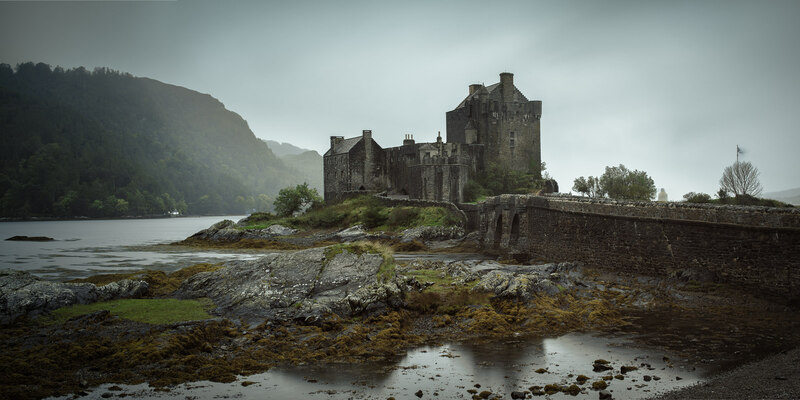 Directions: You can get to Eilean Donan castle by driving to Dornie, the nearest town. Most travellers would probably fly into either Edinburgh or Inverness from where it is a 4 hour or 2 hour drive respectively. If you drive from Edinburgh, be sure to drive via Glencoe, another fantastic scenic area. This is perhaps one of the most famous and most highly photographed of the highland castles. The original Highlander movie was shot here as well. It may not be one of the largest castles around but it has quite a calm and serene presence with the backdrop of the hills and the moody hues of the Scottish Highlands. In the evenings, you can catch the light on the castle from the Northern side of the castle. Likewise, the mornings can give you some great light on the mountains to the North but the hill in front of the castle tends to block light hitting it directly until later in the day. Any moderately wide angle should do. A 35mm may be perfect for general photography. The weather is temperamental, as is always the case in Scotland. Having a rain jacket and some protective covers for camera equipment is advisable. A micro fiber cloth is great when light spray rain meddles with your photography. It can seem gloomy a lot of the time in Scotland but sometimes, such photos can be the most atmospheric if stopped down a tad. Hi, we are Scottish music band and we’d love to have your picture as a CD cover. Can you please contact us?